The violent conflicts started in 1809 with short-lived governing juntas established in Chuquisaca and Quito in opposing the government of the Supreme Central Junta of Seville. In 1810, numerous new juntas appeared across the Spanish domains in the Americas when the Central Junta fell to the French invasion. Although various regions of Spanish America objected to many crown policies, "there was little interest in outright independence; indeed there was widespread support for the Spanish Central Junta formed to lead the resistance against the French." While some Spanish Americans believed that independence was necessary, most who initially supported the creation of the new governments saw them as a means to preserve the region's autonomy from the French. Over the course of the next decade, the political instability in Spain and the absolutist restoration under Ferdinand VII convinced many Spanish Americans of the need to formally establish independence from the mother country. Political independence was not necessarily the foreordained outcome of the political turmoil in Spanish America. "There was little interest in outright independence." As historians R.A. Humphreys and John Lynch note, "it is all too easy to equate the forces of discontent or even the forces of change with the forces of revolution." Since "by definition, there was no history of independence until it happened,"  when Spanish American independence did occur, explanations for why it came about have been sought. In the economic sphere, the crown sought to gain control over church revenues. In a financial crisis of 1804, the crown attempted to call in debts owed the church, mainly in the form of mortgages for haciendas owned by the elites. The Act of Consolidation simultaneously threatened the wealth of the church, whose capital was mainly lent for mortgages, as well as threatening the financial well-being of elites, who depended on mortgages for acquiring and keeping their estates. Shortening the repayment period meant many elites were faced with bankruptcy. The crown also sought to gain access to benefices elite families set aside to support a priest, often their own family members, by eliminating these endowed funds (capellanías) that the lower clergy depended on disproportionately. Prominently in Mexico, lower clergy participated in the insurgency for independence with priests Miguel Hidalgo and José María Morelos. The reforms had mixed results. In some areas—such as Cuba, Río de la Plata and New Spain—the reforms had positive effects, improving the local economy and the efficiency of the government. In other areas, the changes in the crown's economic and administrative policies led to tensions with locals, which at times erupted into open revolts, such as the Revolt of the Comuneros in New Granada and the Rebellion of Túpac Amaru II in Peru. This impasse was resolved through negotiations between the several juntas in Spain counted with the participation of the Council of Castile, which led to the creation of a main government: the " Supreme Central and Governmental Junta of Spain and the Indies" on September 25, 1808. It was agreed that the kingdoms of the peninsula would send two representatives to this Supreme Central Junta, and that the overseas kingdoms would send one representative each. These kingdoms were defined as "the viceroyalties of New Spain (Mexico), Peru, New Granada, and Buenos Aires, and the independent captaincies general of the island of Cuba, Puerto Rico, Guatemala, Chile, Province of Venezuela, and the Philippines." This plan was criticized for providing unequal representation to Spanish America; nevertheless, throughout the end of 1808 and early 1809, the regional capitals elected candidates, whose names were forwarded to the capitals of the viceroyalties or captaincies general. Several important and large cities were left without direct representation in the Supreme Junta. In particular Quito and Chuquisaca, which saw themselves as the capitals of kingdoms, resented being subsumed in the larger Viceroyalty of Peru. This unrest led to the establishment of juntas in these cities in 1809, which were eventually quashed by the authorities within the year. An unsuccessful attempt at establishing a junta in New Spain was also stopped. The escape to Cádiz and the dissolution of the Supreme Central Junta on January 29, 1810, because of the reverses suffered after the Battle of Ocaña by the Spanish forces paid with Spanish American money,  set off another wave of juntas being established in the Americas. French forces had taken over southern Spain and forced the Supreme Junta to seek refuge in the island-city of Cádiz. During this period, royalist forces made advances into New Granada, which they controlled from 1815 to 1819, and into Chile, which they controlled from 1814 to 1817. Except for royalist areas in the northeast and south, the provinces of New Granada had maintained independence from Spain since 1810, unlike neighboring Venezuela, where royalists and pro-independence forces had exchanged control of the region several times. To pacify Venezuela and to retake New Granada, Spain organized in 1815 the largest armed force it ever sent to the New World, consisting of 10,500 troops and nearly sixty ships. (See, Spanish reconquest of New Granada.) Although this force was crucial in retaking a solidly pro-independence region like New Granada, its soldiers were eventually spread out throughout Venezuela, New Granada, Quito, and Peru and were lost to tropical diseases, diluting their impact on the war. More importantly, the majority of the royalist forces were composed, not of soldiers sent from the peninsula, but of Spanish Americans. The increasing irrelevance of the Holy Alliance after 1825 and the fall of the Bourbon dynasty in France in 1830 during the July Revolution eliminated the principal support of Ferdinand VII in Europe, but it was not until the king's death in 1833 that Spain finally abandoned all plans of military reconquest, and in 1836 its government went so far as to renounce sovereignty over all of continental America. 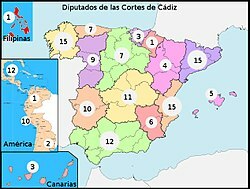 During the course of the 19th century, Spain would recognize each of the new states. Only Cuba and Puerto Rico remained under Spanish rule, until the Spanish–American War in 1898. ^ In 1817, after the triumph of the independents in Chacabuco and the subsequent restoration of the Chilean government, the Chilean Army was again organized, which fought along with the Army of the Andes in the center-south zone of Chile. Later, both armies would form the Liberating Expedition of Peru, although a part of the Chilean force remained fighting in the country until its territorial consolidation. As for the maritime area, between 1817 and 1818 the Chilean Navy ( First Chilean Navy Squadron) was founded and would operate until the end of the war. Between 1817 and 1820, Chile also used corsairs in the sea. ^ Robertson, William Spence (1916). "The Juntas of 1808 and the Spanish Colonies". The English Historical Review. 31 (124): 573–585. doi: 10.1093/ehr/XXXI.CXXIV.573. JSTOR 551442. ^ Lynch, Spanish American Revolutions, 185–189, 247–249, 267–272. Rodríguez, Independence of Spanish America, 219–220, 222–231. Timothy E. Anna, " Chaos and the Military Solution: The Fall of Royalist Government in Peru" in Archer, The Wars of Independence in Spanish America, 272–273. Kinsbruner, Independence in Spanish America, 77–78, 90–95.